Northeast Ohio faces a projected shortage of 3,500 nurses by 2020—a fate that hospital officials throughout the region are working to address. Many of the shortages and challenges in Northeast Ohio reflect the same issues facing the entire country: aging populations, increasing retirements, fewer people entering the workforce and a shift toward population health and keeping communities well that takes a whole new skill set. However, the reputation and growth of Northeast Ohio's medical institutions presents some unique challenges and opportunities. For one, the region is a good sell for someone who wants to enter healthcare. But as a major healthcare region, Northeast Ohio needs more high-skilled workers than other parts of the country, said Pat Cirillo, vice president of initiatives and analytics for the Center for Health Affairs, an advocacy group for Northeast Ohio hospitals, noting that only a few other areas can claim a similar level of international attractiveness for healthcare services. “A shortage in healthcare workers not only impacts our ability to take care of our own citizens; it also impacts our economy, because those are outside dollars coming in,” she said. One month after Detroit Medical Center received a clean bill of health on violations in infection control of surgical instruments, the CMS and the Michigan Department of Licensing and Regulatory Affairs have launched a new investigation. DMC now faces another round of inspections that could lead to possible expulsion from the Medicare program, which could cost the investor-owned hospital system hundreds of millions in federal and state Medicare and Medicaid funds. “The LARA and Joint Commission teams are conducting investigations on behalf of CMS. The federal investigations into this matter are now ongoing,” according to an e-mailed statement from LARA. The facilities being investigated include Children's Hospital of Michigan, Harper University Hospital, Detroit Receiving Hospital and Karmanos Cancer Center. Prompted by a six-month investigation and report by the Detroit News, state and federal regulators found a variety of problems at DMC's downtown sterile processing department that serves four hospitals. They included DMC's Detroit Receiving, Harper University, Hutzel Women's and Children's hospitals. Karmanos Cancer Institute was not previously targeted by inspectors. Mercy Health System wants to build a 13-bed “micro-hospital” in Crystal Lake, Ill., the system's second pitch in six years to open a facility in the far northwest suburb of Chicago. The $81.7 million hospital would not add any patient beds to the area, a crucial point, because many medical centers statewide are saddled with vacant beds. It would serve patients undergoing simple procedures. Instead, Mercy plans to shift 11 medical-surgical beds (the most common in a hospital) and two intensive-care beds from one hospital to the new one, according to an application filed with state regulators. Many hospitals nationwide have been ditching plans for big hospitals in favor of outpatient clinics and surgical centers, which has fueled a wave of emptier medical centers. Advances in technology mean patients don't need to be hospitalized as much. And under federal health reform, insurers are paying doctors to focus on prevention and treat patients in the least expensive place, which often is an outpatient facility. If approved, both the hospital and outpatient building are projected to be complete by late 2020. Indiana's Republican Gov. Eric Holcomb submitted a waiver to continue the state's conservative Medicaid expansion for an additional three years. That's despite congressional Republicans' plans to repeal the Affordable Care Act. The state's Medicaid expansion program, known as Healthy Indiana 2.0, was developed by then Gov. Mike Pence and President Donald Trump's pick for CMS administrator, Seema Verma. While at her health consulting company SVC, Verma also had a hand in developing expansion waivers for Iowa, Kentucky, Michigan and Ohio. Under Healthy Indiana 2.0, beneficiaries pay premium contributions, have health savings accounts, get incentives for healthy behaviors, and a face a benefit lock-out if they don't pay premiums. 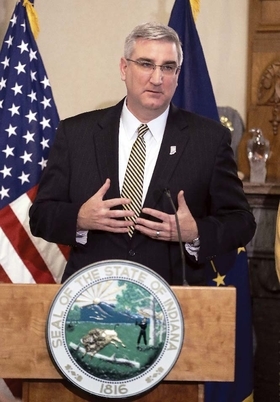 Holcomb was the state's lieutenant governor while Pence was in office. HIP 2.0 has been codified into state law, which may be the reason Holcomb is submitting the waiver at a time Republicans look to end Medicaid expansion through repeal of the Affordable Care Act. The draft version of the waiver had no major changes to the program and it maintained eligibility of the program at 138% of the federal poverty level, which was set in the ACA. As many as 350,000 people are believed to have gained access through HIP 2.0.